China, Russia, Kazakhstan, Kyrgyzstan, Tajikistan, & Uzbekistan have yet to take new members. Richard Weitz explains why. For the first time in almost a decade, the annual Shanghai Cooperation Organization (SCO) leadership summit decided to admit another formal observer, Afghanistan, to its ranks. The leaders attending the June 6-7 summit in Beijing also let Turkey join Belarus and Sri Lanka as a formal “dialogue partner”. Even so, the SCO has not fully overcome its expansion dilemma. The SCO designated its first formal observer, Mongolia, in June 2004, after having finalized regulations on the observer status earlier that year. India, Iran, and Pakistan became observers at the 2005 summit in Shanghai. Other countries have since expressed interest in becoming formal observers. But the SCO has not yet moved forward in accepting new participants—until now. Has the SCO finally broken its expansion impasse? Probably not—since the SCO again failed to promote any existing observer countries to full membership. Iran, India, and Pakistan lobbied hard for such status, but were again blocked, probably by host nation China, with no timetable when they might finally enter. Despite this, the SCO has never accepted another full member. The current roster of members includes only those six states that joined the organization at its founding: China, Russia, Kazakhstan, Kyrgyzstan, Tajikistan, and Uzbekistan. Until recently, the stated reason the organization has not acted on their applications or designated any new members is, despite several years of discussions, that SCO governments have been unable to define a legal basis for increasing the number of members. In the past, the SCO had established formal partnerships only with other multilateral organizations. The Yekaterinburg summit decided to grant Belarus and Sri Lanka the “dialogue partner” status. These partners cannot sign SCO documents or participate in SCO decisions; they can only offer advice in areas of cooperation specified in a memorandum. 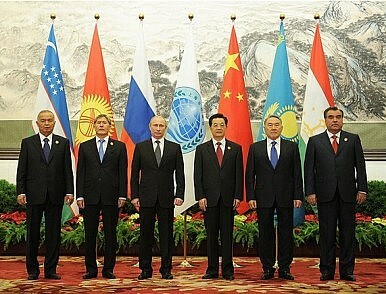 The June 2010 SCO summit in Tashkent formally agreed on the minimum eligibility for full membership: the state has to be located in Eurasia; already have observer or partnership status within the SCO; have diplomatic, economic, and humanitarian ties with all existing SCO members; and not be subject to UN sanctions or in a state of armed conflict with another country. Yet, the SCO governments claimed they needed another year to finalize a memorandum detailing the commitments of states seeking full SCO membership. The group formally approved the commitment memorandum at the 2011 Astana summit but have since cited other reasons for delaying any membership decisions. In Beijing, Russian President Vladimir Putin said the next SCO summit, which will occur in the Kyrgyz Republic next year, would finally resolve the general financial, legal, and administrative procedures for admitting new members into the organization.